A man in his 60s was hit and killed by a police officer while jay walking. 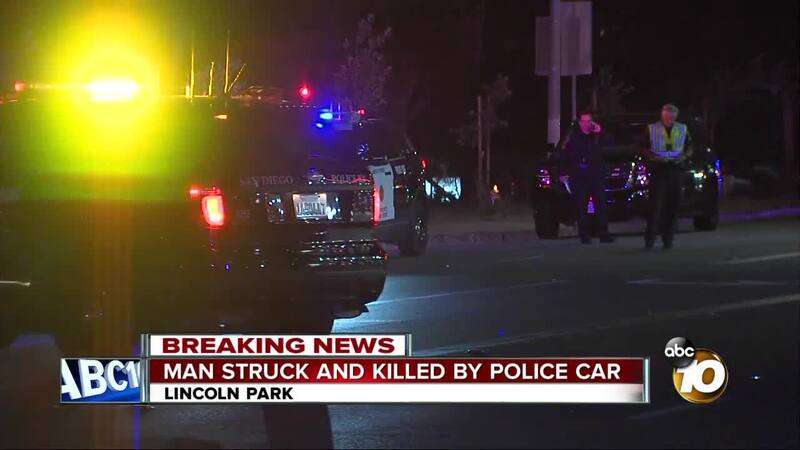 SAN DIEGO (KGTV) -- A pedestrian who was struck by a San Diego Police Department vehicle Monday night has died from their injuries, authorities said. The crash happened around 8 p.m. at the intersection of 47th Street and Imperial Avenue, about a block west of Lincoln High School. A marked SDPD vehicle was patrolling the area northbound on 47th Street when it struck the victim. The unidentified victim, described as a male in his 60s, was transported to a nearby hospital where he died from his injuries. It does not appear the man was in the crosswalk when he was hit. The officer in the vehicle was not injured in the crash. Stay with 10News for updates to this developing story.